ATLANTA, GA--(Marketwire - November 9, 2010) - Creating "suite" holiday magic has never been easier than with special Midtown Atlanta weekend hotel deals that include luxury hotel suite accommodations and discounts on Atlanta holiday shows. Tickets to traditional and not-so-traditional presentations, both perfect for creating a special holiday weekend, are available at discounted rates with the "Holiday Magic in Midtown Atlanta" hotel deal that is offered for select dates through December 27, 2010 at the newly renovated Atlanta Marriott Suites Midtown. Rates for this one-of-a-kind among Atlanta weekend hotel packages start as low as $129* and include deluxe hotel suite accommodations for one night, a "sweet" treat of milk and cookies served via room service, a unique holiday ornament and special note from Santa, complimentary hotel self parking and the opportunity to purchase discounted tickets to the Atlanta Ballet's Nutcracker and Cirque du Soleil: OVO. The traditional magic of the holiday season resonates through an enchanting performance of the Atlanta Ballet's Nutcracker November 27 through December 26. Midtown Atlanta Marriott guests may purchase tickets at a 25% discount and join audiences of all ages to watch in awe as childhood dreams come to life on stage at the Fox Theatre. Although less traditional, The Cirque du Soleil: OVO presentation at Atlantic Station is a captivating adventure filled with spectacular acrobatic performances and brilliant costumes and scenery to portray the hidden and secret world of a colorful and productive ecosystem. Sure to be a hit with all ages, tickets for Monday-Friday performances November 4 through December 5 are available at a 15% discount. Guests utilizing this package will enjoy a spacious suite with separate bedroom, oversized bathroom with shower and tub, two televisions with cable/satellite service and premium movie channels, refrigerator, coffee maker/tea service and luxury bedding ensembles of crisp linens, fluffy pillows and down comforters. Accommodations for hotel suites in Atlanta with the "Holiday Magic" package may be booked online by using promotional code E0O at http://www.marriott.com/hotels/travel/atlms-atlanta-marriott-suites-midtown/ or by calling 1-800-228-9290 for reservation or information. Show tickets must be purchased separately with discount links and codes available on hotel website. *Promotional rates based on availability 11/26-28, 12/10-12, and 12/16-27. Offer does not apply to groups of 10 or more rooms and may not be combined with any other discount or promotion. Advance reservation required. 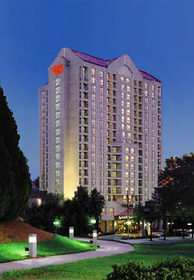 The Atlanta Marriott Suites Midtown Hotel is a luxury all-suite hotel property providing convenient access to many popular attractions such as the Woodruff Arts Center, Piedmont Park and Georgia Tech. Offering grand Southern hospitality, the Marriott Midtown is one of the most sophisticated hotels near Atlantic Station, popular theatres, restaurants and Midtown Atlanta nightlife. Guests have access to the hotel's indoor/outdoor connecting pool, whirlpool and state-of-the-art fitness center in addition to a fine choice of dining options. Stay at our convenient midtown location.